Jeans are durable, versatile and you can wear them to the office and pub, and everything in between. So why not hit the trails in your denim? Well maybe because they’re not warm when it’s cold, too warm when it’s sweltering outside, they’re incapable of shedding water. And honestly, when was the last time you saw someone working out at a gym in a pair of jeans? Repeat after us: Cotton is your enemy– and blue jeans, they are 100% cotton. While hiking in jeans in the great outdoors may look stylish (maybe), it is utterly impractical because cotton retains moisture instead of wicking it away like wool and polyester fabrics do. This means water, sweat, and mud will easily cling to your jeans. Denim also takes a long time to dry, so if you sweat that stanky stuff is there to stay. Denim is often stiff and does a brilliant job of making you perspire. Which can lead to chafing (aka the dreaded “chub rub”) and besides forcing you to walk funny, chafing can cause blistering and sores, to the point where you can’t continue hiking. Proper trekking pants reduce that friction, release your sweat and heat, and keep those sensitive legs of yours cool, dry and happy. Strangely enough, despite their thickness and stiffness, jeans don’t keep you very warm, especially on the trails. Sometimes in chilly weather, jeans even draw the warmth out of your legs and form tiny warm sweat crystals on the outside of your pants. If you really want crystals on your pants, we recommend you just bedazzle them. So: say you are hiking in the snow, and you step through a frozen stream and soak your pants. Your jeans are going to turn into a slab of ice, because cotton can absorb 7% of its weight in water, while polyester only absorbs 0.4%. What’s worse, wet clothing puts you on the fast track to hypothermia because it conducts heat away from your body freaking 25 times faster than dry clothing. But if you can’t, here’s a synopsis: good ol’ Outbound Dan dips a pair of jeans and nylon pants into a bucket of water. After an hour in the cold, the nylon pants have a few dainty crystals that shake right off, while the jeans are comically frozen and so stiff that you could probably use them to battle a bear or hammer in some nails. So what should you wear instead? The answer is easy: literally any pants made with moisture-wicking fabric. That includes wool, nylon, polypropylene, spandex, rayon and even some types of silk (weirdly enough). Also, many synthetic wicking fabrics are coated in nifty resins so that they won’t get bleached by the sun or dyed green by chlorine. So even if you drop a pretty penny, you will most likely be getting a lot of use out of these clothes because they are truly meant to combat a spectrum of weather conditions. If we have done our job right, you should hate jeans by this point in the article. Just kidding! But truthfully, denim won’t do you any favors while hiking. 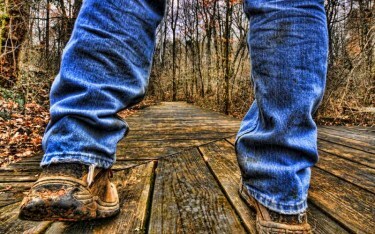 So if you are hitting the trails, leave those blue jeans at home.